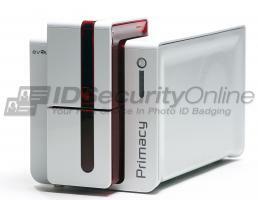 The Evolis Primacy ID card printer is feature-packed to print high-quality single or dual sided badges on the spot. With built-in USB and Ethernet and a pioneering 3-year manufacturer's warranty, the Evolis Primacy ID card printer is ideal to issue employee IDs, access control badges, student IDs, healthcare cards, or membership cards. Available in red or blue, the Evolis Primacy ID card printer is a compact, lightweight printer that will fit great in any environment. The Evolis Primacy ID card printer has also been designed to be upgraded with encoding options in minutes! You can also turn a single-sided model into a dual sided printer with a simple activation key. 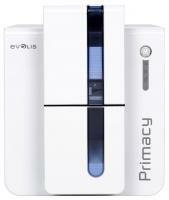 Issuing professional ID cards and badges is just easier with an Evolis Primacy ID card printer! WHAT ARE THE MAIN SPECIFICATIONS OF THE EVOLIS PRIMACY ID CARD PRINTER? The Evolis Primacy ID card printer is a reliable solution to print all your cards and badges in high resolution. CAN I STORE DATA ON MY CARDS WITH AN EVOLIS PRIMACY ID CARD PRINTER? To print and encode cards with a magnetic stripe, choose a Primacy ID card printer with a magnetic encoder. Widely used in access control and time & attendance, magnetic cards are an affordable choice for your badges. If you need more secure badges, opt for a Primacy ID card printer with smart card encoder. With contact and contactless smart cards, the data is securely encoded into an embedded chip. To store data and to be read, a contact smart card must be inserted into a reader, when contactless smart cards only need to be waved within range of a reader. CAN I UPGRADE MY EVOLIS PRIMACY ID CARD PRINTER TO DUPLEX? Yes and you don�t need to install any module. All you need is an activation key! Purchase an activation key, insert it in the printer and within seconds, your Evolis Primacy ID card printer becomes a dual-sided unit! A dual-sided version of your Evolis Primacy ID card printer will allow you to add more information to your cards and create multi-feature badges on the spot.